If you’re looking to visit one of the oldest towns on the French Riviera, Saint-Paul de Vence is the perfect location for you. The medieval architecture of the city sits high in the Alps and towers above the valleys below. As you venture into the city and further along the winding cobblestone streets you feel as though you have stepped out of reality and into a storybook. When planning your itinerary to this magical city you are going to need to know what things to do in Saint-Paul de Vence, France. Of course, on your trip, you could spend days touring and taking everything in. If you have limited time, however, here are our must-see locations for you to make sure you check off your list. 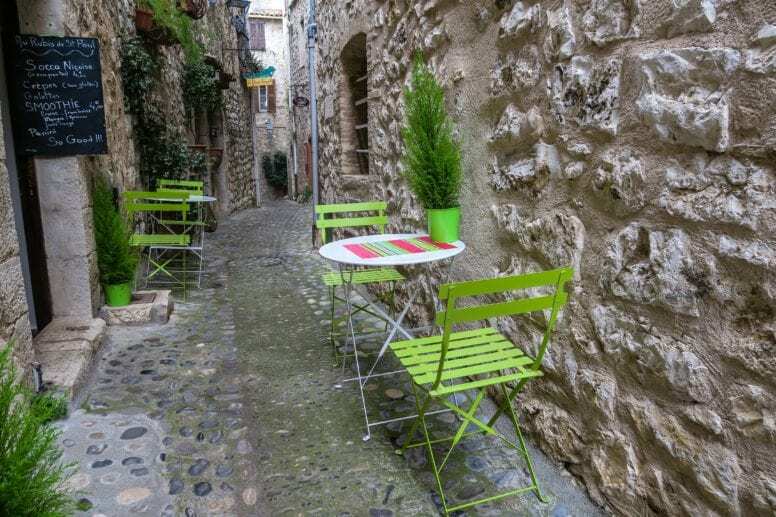 How to get to Saint-Paul de Vence, France? Saint-Paul de Vence is located in the south of France in the region of Provence-Alpes-Côte d’Azur. The nearest airport is the Nice Côte d’Azur Airport, situated about 13 km away and serving both international and domestic flights. There are three ways to reach Saint-Paul de Vence from the Nice airport, you can rent a car, catch a taxi or go for a most affordable option and take a bus. Your bus number is 400 and it departs from the bus stop called “Aéroport Promenade” located a short distance from Terminal 1. Travel tip: the French Riviera is a wonderful destination for exploring many beautiful towns. 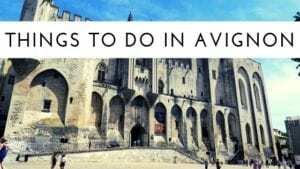 After visiting Saint-Paul de Vence you can easily head to the famous Pope city Avignon, relax on Pampelonne Beach in Saint-Tropez, navigate on the magical canals of Port Grimaud, the Venice of France, or follow in the footsteps of Paul Cezanne in Aix-en-Provence. If you decide to rent a car you’ll have to think about parking options in Saint-Paul de Vence. Depending on where you’re staying your hotel might be providing free parking for the guests so make sure to check with them before arrival. Otherwise, there are parking lots available just outside the city but they are all pretty expensive. As an example, the Indigo Parking at the Rond Point Sainte Claire costs around € 29 for 24 hours so keep in mind this additional cost when planning to come by car. If you’re coming by camper you’re lucky because there are free parking spaces for them just opposite the Fondation Maeght. There are also some public parking places available near St.Paul de Vence which are free after 7 pm. 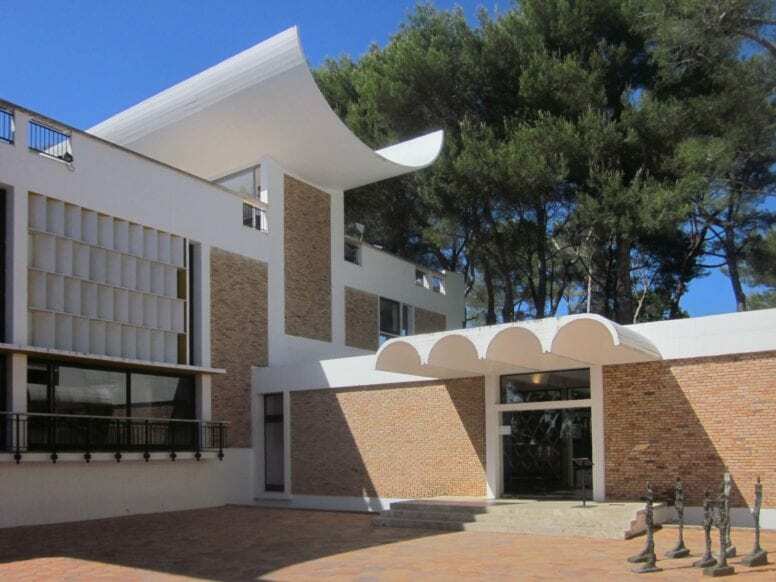 Whether you are into art or not, a stop at Fondation Maeght is necessary during your time in St. Paul de Vence, France. Fondation Maeght is a sprawling contemporary art museum located just outside of the city. When you visit the beautiful campus you will not only find hallways and galleries filled with beautiful art, but you will also find a bookstore, library, cafe, and beautiful parks area. Like other art museums, Foundation Maeght contains works of art that are constantly on display as well as traveling exhibits. You can find a list of current exhibits on their website. However, no matter what is featured while you are on your trip, Fondation Maeght is an essential stop. Although it is located a short drive away from St. Paul de Vence, if you are in the region of the Chateau Grimaldi it should be considered a crime not to visit. Built on an ancient fort that was once occupied by the Greeks and Romans, Chateau Grimaldi is certainly a sight to see. The tall towers, intimidating walls, and intense corridors are reminiscent of a knight’s castle from a fairytale. The true beauty of Chateau Grimaldi, however, can be found in the hand-painted ceilings of the on-site chapel. 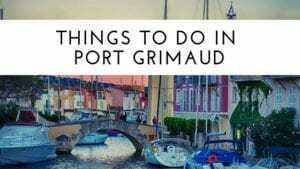 When you travel to Chateau Grimaldi, scheduling an entire day for your trip is a good idea. Wandering the grounds and exploring the on-site museum will occupy at least a few hours. Likewise, there are many opportunities to stop and have a romantic picnic along the way. Born in 1887, Marc Chagall was a famous Jewish artist known for his paintings and work in modernism. Chagall lived through a myriad of wars and tragedies including two World Wars. He and his wife escaped the Holocaust by fleeing France. Today, you can see his art in stained glass windows around the world and would likely even recognize some of his more popular paintings. Although he passed away in 1985, Chagall is still regarded as the most renowned Jewish artist in history. His grave is quaint, simple and located in the St. Paul de Vence city cemetery. Although it doesn’t take long to visit, a short trip to see this well-known artist’s grave is humbling and beautiful. And, if you plan to visit, don’t forget to take a small rock to leave as a sign of respect. One of the most ancient structures in St. Paul de Vence, France, the Esperon Tower is certainly a sight to see. The tall tower originally did not stand alone but was part of the medieval retaining wall that surrounded the city. Throughout time, small details have been added to the tower to serve its many functions – including as a gunpowder store. The majority of the tower, however, is still in its original form. 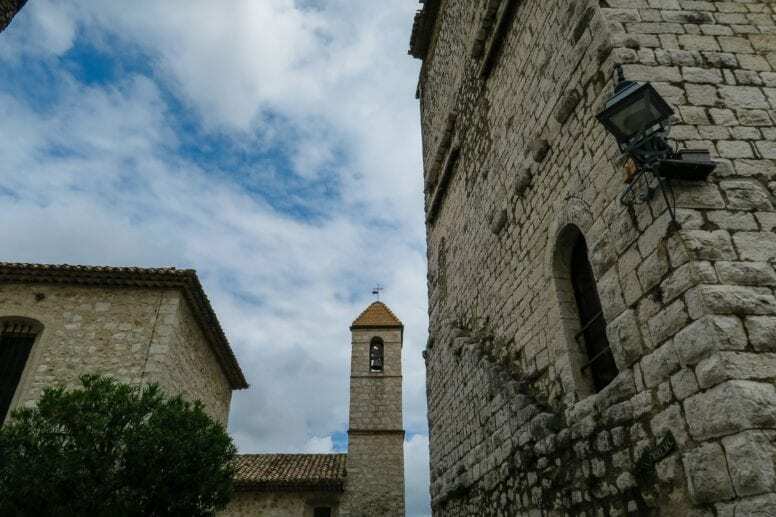 For your trip to St. Paul de Vence you can take a guided tour that stops at Esperon Tower, or simply choose to take a route on your walk through the city that goes by. Either way, you will certainly enjoy seeing this historic site. If you want to see an absolutely stunning and historic estate, a day trip to one of the most famous castles in the region should definitely be on your list of things to do. High up in the hills in the middle of St. Paul de Vence, France you will find the remnants of a medieval castle now known as Chateau de Villeneueve-Loubet. This ancient structure is breathtaking in both its size and beauty. In fact, the castle even has it’s very own drawbridge – a true fortress! Many visitors to Chateau de Villeneueve-Loubet can spend a morning or an afternoon taking in the sights throughout the castle and around it. But, if you are on a more restricted time schedule for your trip you can take a walking or bus tour that makes a stop at this infamous location along the way. Take as many pictures as you can, after all, you don’t want to miss out on any of the beauty or charm this absolutely amazing site has to offer. One of the most beautiful nature parks you will find near St. Paul de Vence, France the Pac des Rives du Loup is worth a day on your trip. The winding river falls down limestone cliffs and hills creating beautiful rapids and small waterfalls along the way and ancient trees, older than most of the medieval buildings in town, stand tall along the river as well. Take an afternoon and go for a picnic at Parc des Rives or get up and make your way early in the morning to enjoy the rising mist. Either way, you will not regret your time at this one-of-a-kind destination. The Notre-Dame de la Nativité Cathedral is another place that should end up on your list of the best things to do in Saint-Paul de Vence. Dating back to the 11th century this structure lies on ruins from the Roman times and is apparently France’s smallest cathedral. The interiors feel so calm and mystical with dim lighting add up to the spiritual atmosphere. 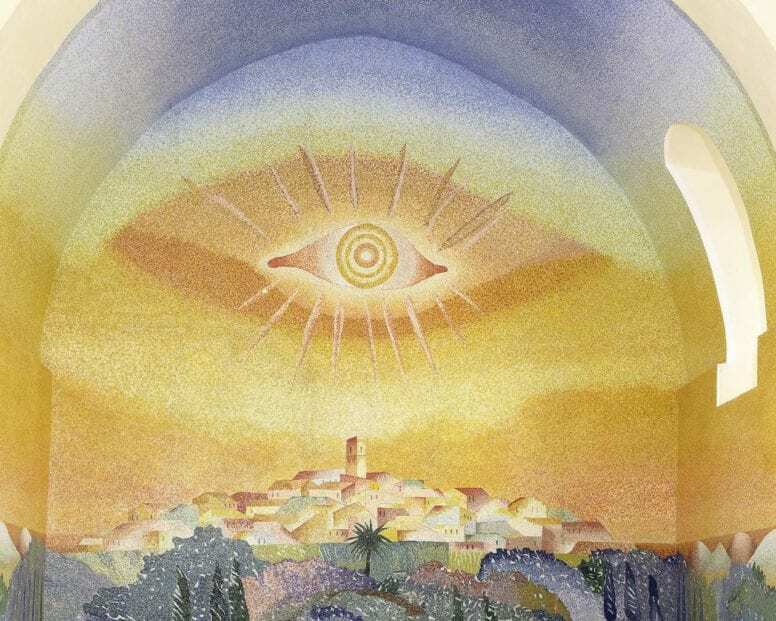 Pay attention to the Baptistery – it was decorated with a mosaic by the Russian-French artist Marc Chagall. 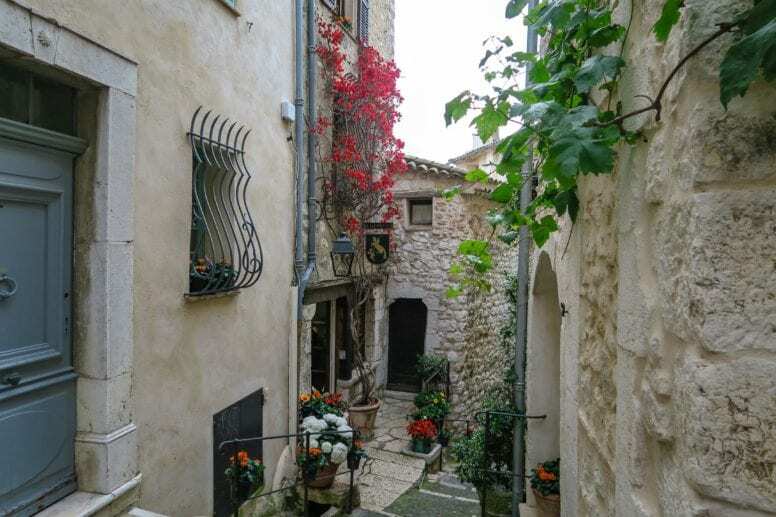 There is no better place where to gain some knowledge and learn a bit more about the history and culture of Saint-Paul de Vence than in this charming Local History Museum. This small place is filled with interesting items that will take you for a fascinating walk in the past. You’ll get a chance to admire the ancient outfits of kings, religious leaders and of people living in the times gone by involved in crucial historical moments of the city. I found their costumes really fascinating and my time in this museum was certainly well spent. Buying a ticket to the Local History Museum will give a free entry to La Chapelle des Penitents Blancs as well – keep reading below if you want to learn more about it! Opening Hours: Daily from 1 May to 30 September: 10 am to 12.30 pm and 2 pm to 6 pm. from 1 October to 30 April: 10.30 am to 12.30 pm and 2 pm to 4 pm. 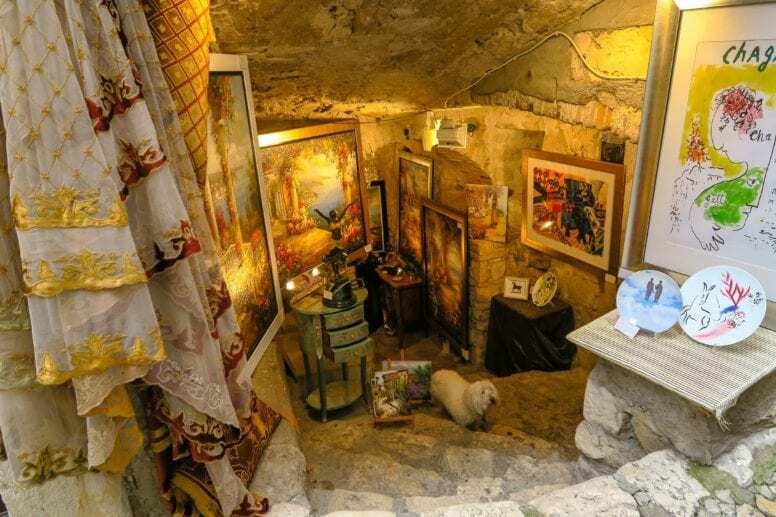 Another fascinating point of interest to put on your list of things to do in Saint-Paul de Vence is certainly La Chapelle des Pénitents Blancs. The place is a charming chapel with walls covered in murals, mosaics, and other incredible artistic creations. Inside you’ll also find some sculptures and you’ll be impressed with the ethereal beauty of stained glass windows. The chapel, designed by a Belgian artist Jean-Michel Folon is a mystical and peaceful place and a real hidden gem in Saint-Paul de Vence. 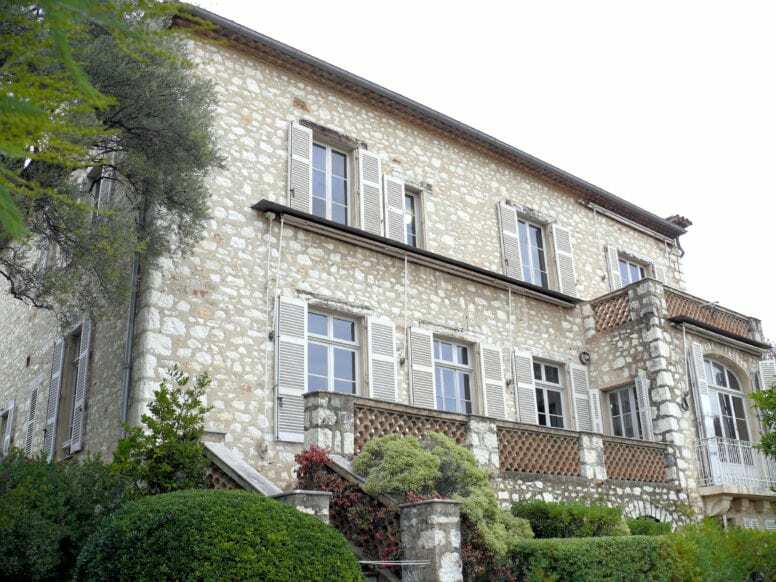 Not far from Saint-Paul de Vence, in Cagnes-sur-Mer lies Renoir Museum – a place dedicated to the French artist renowned for his beautiful paintings in Impressionist style. Situated in a stunning villa, where Renoir actually lived, the Museum is immersed in greenery, surrounded by trees and plants and by the sound of the waves hitting the shore just a short distance away. Inside the Museum is filled with Renoir’s art pieces, photographs, antiques and even with some of Renoir’s original furnishings. There are also many paintings on display by other important artists that are certainly worth to see as well. Once there take advantage of the hillside view of the Mediterranean Sea too – absolutely breathtaking and a stunning photo opportunity. Tour where you’ll discover many interesting details and facts about his works, family and life. No trip to France can be considered complete without trying at least some of the most important and traditional dishes of the region. In fact, French Riviera is filled with so many fantastic restaurants that serve delicious culinary local specialties. And apart from visiting museums, art galleries and chapels a trip to Saint-Paul de Vence is a great opportunity to get to know new flavors, herbs and spices as well. One of the must-haves during your gastronomic adventures in Saint-Paul de Vence is definitely trying the authentic ratatouille. Ratatouille is a healthy vegetable dish with a mix of herbs that will help you gain your daily quota of vitamins straight from a plate. It’s also pretty light so it comes highly recommended especially in hot summer days when the temperature is particularly high. Another flavourful dish to try is salade niçoise which is a typical French Riviera salad with tomatoes, eggs, olives and anchovies – so yummy! Other mouthwatering options you can try in Saint-Paul de Vence are a bourride and a bouillabaisse (a kind of fish stew), a pan bagnat (sandwich) and pieds paquets (lamb meat). The Place de la Grande Fontaine is one of the most emblematic locations and still very much the nerve of Saint-Paul de Vence. This ancient square attracts a huge amount of tourists and locals alike and is always filled with chatter, friends catching up and people from all over the world trying to take photos. Right above there is a lovely place to stop for lunch or for dinner – Restaurant La Fontaine. It is a truly charming place with a delicious menu and an amazing view of the historical square. Soak in the beauty of this place, think about those who lived there centuries ago and take as many photos as possible before moving on and exploring the rest of Saint-Paul de Vence. 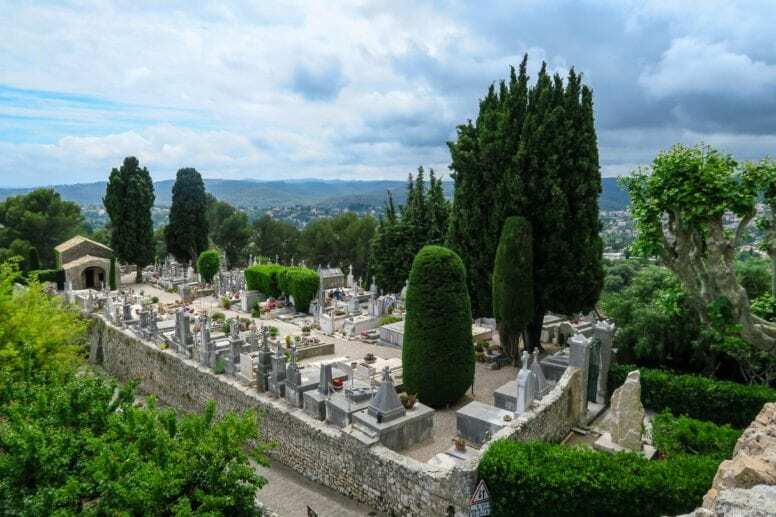 Very near to Saint-Paul de Vence lies the city of Vence which is home to the beautiful Rosary Chapel – another important historical point of interest you can’t miss. This unique chapel was painted by Henri Matisse – a famous French artist who managed to combine simplicity with colors creating an extraordinary result. Of course, the amazing stained glass windows are the first thing to draw your attention although the design, in general, is very minimalist and essential. They are made of three colors (yellow, green and blue) and fill the room with light. The atmosphere inside is peaceful and calm and you can take your time to soak it all in, spend a moment praying or clear your mind and relax. In the adjacent museum space, you’ll have a chance to see an important set of preparatory works of Matisse such as drawings, engravings, models, photos, texts as well as liturgical clothes designed by Matisse. If you’re on holidays in Saint-Paul de Vence, France you should be taking your time and celebrating your breakfast/brunch properly. After all, it’s not every day you get to enjoy the authentic, freshly baked French croissants or a warm baguette with a homemade jam. Cafe de la Place is a perfect place to savor all these local specialties, sip on your coffee, read a newspaper and watch French people going about their business. The menu is pretty extensive so you’ll surely find something you like to eat and drink and you’ll be fully satisfied and ready to explore all the amazing attractions waiting for you in Saint-Paul de Vence. It’s also very likely that you’re actually sipping your cappuccino at the exact same place where artists such as Matisse, Picasso or Chagall just to name a few enjoyed their drinks years before. While you’re having your meal, you’ll also have a chance to see the locals playing bowls right next to the restaurant – a sport especially loved by the elders who get together and enjoy a nice morning outdoors. If you want to bring home a really special souvenir that will remind you of your fantastic holidays in Saint-Paul de Vence long after you returned to your country consider buying a unique art piece in one of the local galleries. The medieval village of Saint-Paul de Vence is filled to the brim with charming little art galleries and exhibition rooms. Many talented painters, photographers and sculptors follow in footsteps of some of the world’s most prominent artist who used to live and create in Saint-Paul de Vence and open their own workshops and galleries. Having one of these creations in your living room is one way to keep your holiday memories alive and they’ll also make a thoughtful and unique gift for family and friends. Now that you have a list of things to do in Saint Paul de Vence, France it’s time to get on your way. Just hop on the next flight to the Nice Airport, rent a car, and you’ll be on your way to one of the best destinations in France. 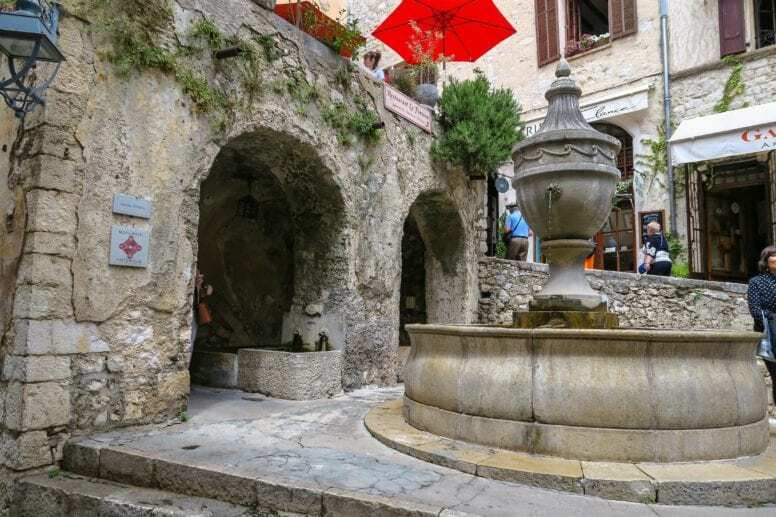 If you’re wondering where to stay in Saint-Paul de Vence check out our list of the best hotels available in this medieval village. Some of them are located right in the heart of the town while the others are situated a few kilometers away. 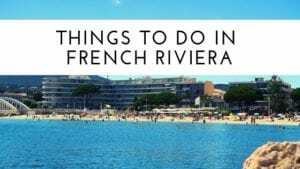 It’s also worth to know that hotels in Saint-Paul de Vence and in many other picturesque locations in French Riviera don’t have much in common with the huge chained-brand hotels around the world. All the options I listed below are small, charming, tranquil and often family-run places located in villa-like structures. Enjoy your stay there! Les Bastides Saint Paul is a lovely 3-star hotel immersed in greenery located a few kilometers away from the village. If you’re visiting in the summer, you’ll want to take advantage of the great outdoor swimming pool available. The rooms are cozy and well-furnished and some of them come with a private balcony or with a terrace. If you’re coming to Saint-Paul de Vence by car, Les Bastides Saint Paul Hotel is just perfect because it provides a free parking space for all the guests. Also, if you’re traveling with a family there are triple and quadruple rooms available in this hotel as well. 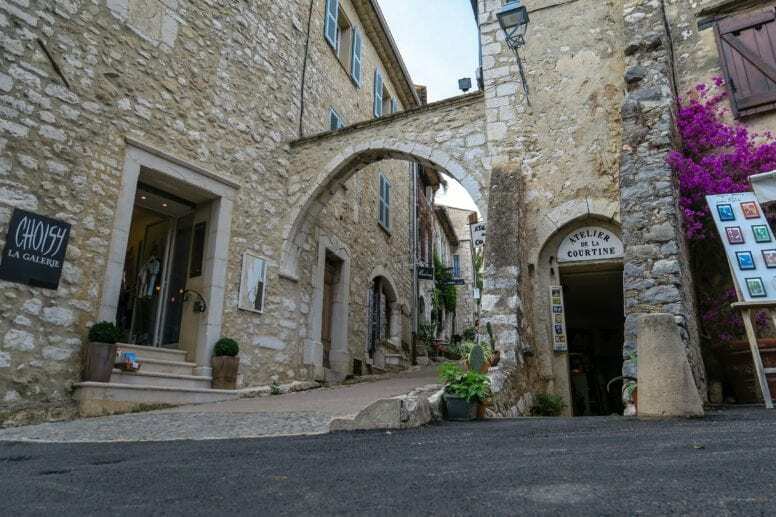 Hotel les Vergers de Saint Paul is another interesting option for those looking for a nice accommodation when traveling to Saint-Paul de Vence. This 4-star hotel which comes in a small, villa-like building offers comfortable rooms in romantic scenery. There is a lovely swimming pool, a garden, free parking and a delicious breakfast available for all the guests. If you want to spoil yourself a little bit then book the special suite with a private terrace, direct pool access, and a relaxing jacuzzi bathtub. If you’re looking for an apartment-style accommodation check out the Etoile De Saint Paul. Each room comes with a small kitchen area with an oven, microwave, fridge and a dining area. It is also possible to eat outside, next to the pool which is especially nice in the summer when the weather is warm and nice. The outdoor swimming pool is heated so it can be used almost at any time of the year, also given the moderate climate in the region of French Riviera. 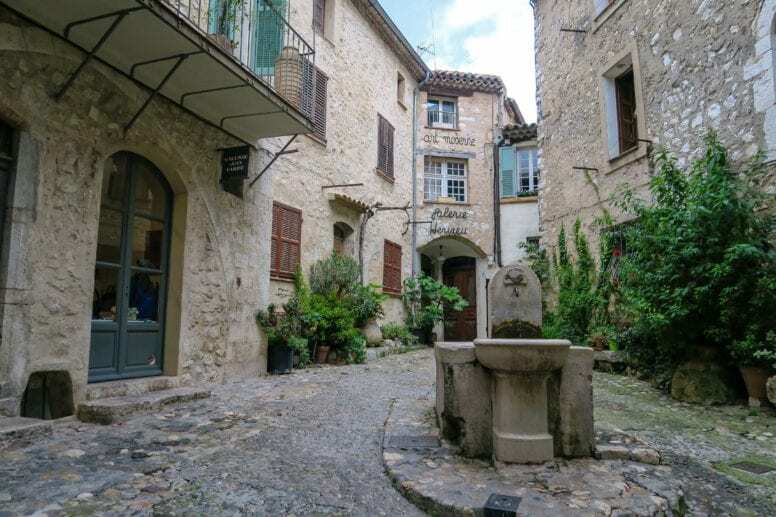 Hostellerie de la Fontaine is an excellent solution for those of you who wish to stay exactly in the heart of the medieval village of Saint-Paul de Vence. In fact, it is located right over the famous Place de la Grande Fontaine and a short walk away from all the other top points of interest. This is also where one of the nicest restaurants in Saint-Paul de Vence is located so you won’t have to worry much about where to eat your dinner. The rooms at this hotel are modern and stylish and always spotlessly clean while the view from the windows is pretty Instagram-worthy. If you decide to have your breakfast at the hotel you’re not going to regret it – it’s simply delicious. Les Messugues is another wonderful hotel in Saint-Paul de Vence. I fell in love with the cozy style of this place, home-like rooms, elegant swimming pool and neat garden surrounding it. If you’re traveling with your family take a look at the apartment option (entire unit located on the ground floor) which has a little kitchen area and garden access. The view of the nearby vineyards is the cherry on the cake and makes this place even more magical and unique. If you’re looking for a unique dining experience with mouthwatering food and high-quality wine you’re definitely in the right location. Visit one of the restaurants in Saint-Paul de Vence we’ve listed below, we hope you’ll enjoy a gastronomic feast like no other. La Brouette is a historical place and one of the oldest restaurants in Saint-Paul de Vence. This rustic eatery with wood tables, soft lighting, and a warm atmosphere is a synonym of a perfect night out in French Riviera. The menu is very short and contains only the most delicious and high-quality options. La Brouette is an ideal restaurant for dinner with friends or for a romantic night out with your loved one – in any case, you’ll enjoy the food and have a great time. La Colombe d’Or is another historical restaurant you should try during your stay in Saint-Paul de Vence. It dates back to 1920 and throughout the years was frequented by international personalities such as Joan Miró, Picasso, Chagall or Serge Reggiani just to name a few. In fact, many remarkable art pieces by famous painters are still hanging on the restaurant’s walls to these days and can be admired by the guests. La Colombe d’Or serves the traditional French cuisine and the classic menu hasn’t changed much over the years (which is definitely a good thing). The interior is elegant and you can really notice the attention to details anywhere you look. All in all La Colombe d’Or is an iconic restaurant definitely worth visiting, a fascinating dining place and one of the most fun things to do in Saint-Paul de Vence. Make sure to reserve a table well in advance as they get fully booked quite quickly. One of the best places where you can try the local cuisine is certainly Le Caruso restaurant. As we can read on their official website “the chef at Le Caruso offers menus made from fresh and local products, from the nearby markets and also from other regions such as the Jura for cheese or Italy for olives and oils. The menu includes flavourful options such as French cheese, marinated veal in kumquat fruit or green salad for starters and duck filet, cod filet and beef filet for main courses. You also mustn’t leave without a dessert. I fell in love with their fig in caramel soup and salt butter but there are other options that seem as interesting. If you want to add an asian twist to your holidays in Saint-Paul de Vence check out the Mister Check restaurant. This is a simple and casual eatery with just a few tables inside and a couple outside, perfect for a quick and unpretentious lunch or snack. There is quite a wide selection of authentic thai food which I highly recommend because one of the chefs is actually Thai and she will make you the best Pad Thai you’ll ever find in the in South of France. If you’re not a thai food lover, worry not! You can also have pizza, burgers or a salad if you like. All in all the entire menu is really good and made of fresh and high-quality ingredients. Wow, St Paul de Vence looks wonderful! I’m planning my next holiday in Provence and I’ll add this beautiful town to the list. Isn’t it gorgeous?!? We loved Saint-Paul de Vence as well! It has all the ingredients of an ideal town in Provence. 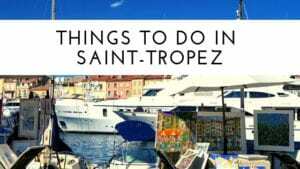 Make sure to visit it during your next trip, together with Monaco, Nice, Cannes and, a little bit farther, St. Tropez. Each place has its unique charm and they’re perfect destinations for day trips. Where is Saint-Paul de Vence?